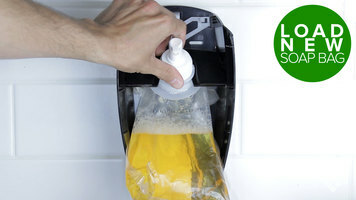 Learn how to quickly and easily refill your Kutol soap dispenser! 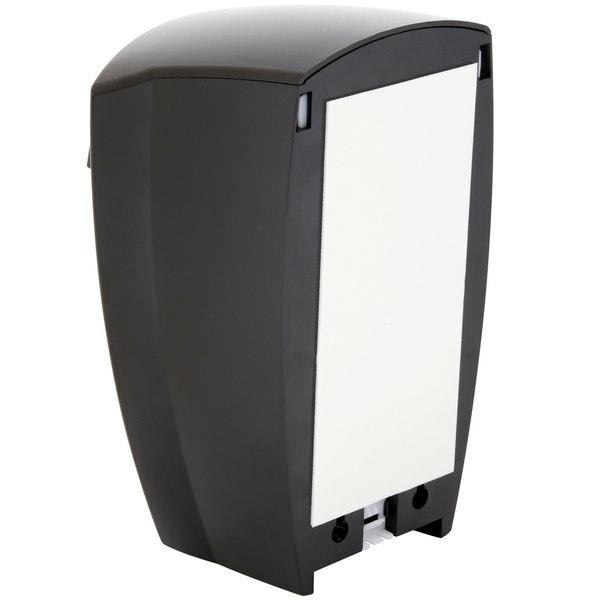 The black Kutol Health Guard dispenser features a large, easy to use push pad located at the top rather than the bottom of the dispenser. The push pad placement lets users see the amount of product being dispensed into their hand, thus reducing waste caused by over-dispensing. The risk of leakage at the valve is also eliminated. This dispenser is ADA Compliant, requiring one hand and less than 5 lb. of pressure to dispense product. The Health Guard system dispenses .75 mL of foam per push versus 1.5 mL per push for most bag-in-box liquid systems. Assuming one dose per hand washing, Health Guard will provide twice the number of hand washings per 1000 mL bag. The Health Guard dispenser features smooth contemporary lines, a textured non-glare surface and tough ABS plastic construction. The multi-purpose view window makes it simple to monitor the soap level and provides an ideal location for product labeling. Each dispenser comes with a full set of easy-to-install product labels. The dispenser can be mounted via screws or double sided tape, which is included. 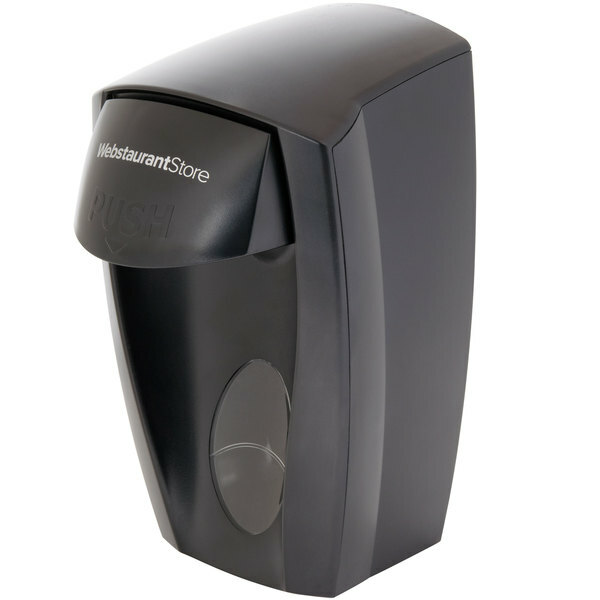 For added convenience, this dispenser can accommodate foam or liquid soap. Black and White Unisex Restroom Sign with Braille 9" x 6"
These soap dispensers works great with the Kutol Health Guard Hand Soap. They were easy to install, easy to fill, and are easy for our customers to use! Decent soap dispenser with a few issues. 1- make sure the screw into the wall using wall anchors - the provided tape will eventually make the dispenser fall off the wall. 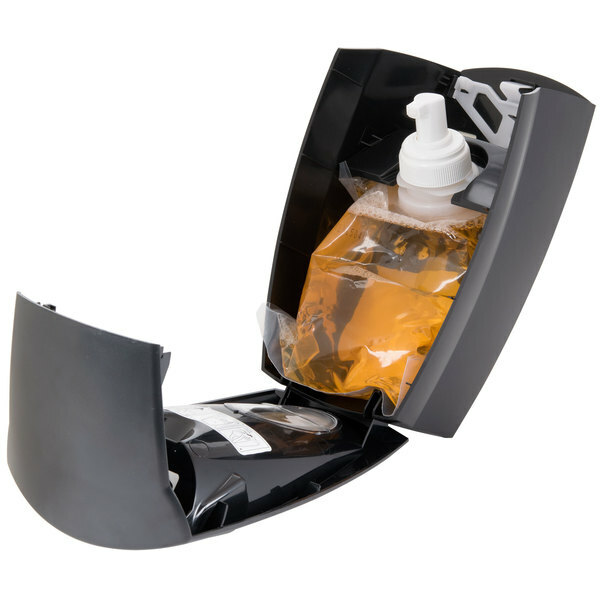 2- snapping the dispenser closed with a full soap bag in it is difficult usually leading to soap leakage. Thank you for the review Greg. We’re sorry this has not worked well for you. 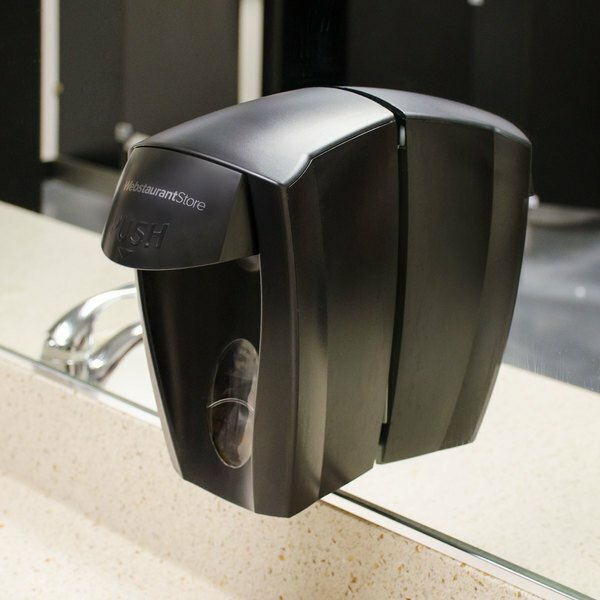 For an alternative that might better meet your needs, check out this Types of Soap Dispensers Buying Guide! These may be a less expensive soap dispenser option, but they work as intended and they are super easy to install. Don't let Cintas talk you into spending $4/month for their "fancy" colorful dispensers. These work just as well for a fraction of the cost. This hand soap dispenser is perfect for our food truck. It mounted nicely to the walls of the truck and doesn't take up too much space. these are great to have. save space at the sink, prefessional looking, hardly gets dirty or nasty since it is easy pump. beens using this for 7 years and still ship shape. easy to install and replace the refill. I couldn't believe the price when I saw this, so I had to buy it. I was suprised that I could buy this professional fixture for the low price. Works great, I love it! Great soap dispenser for the price! Have used other pricer ones but this one does the job and distributes the foam soap without ever getting clogged unlike other dispensers. Would definitely recommend and purchase again! This is a nice soap dispenser for the foaming hand soap. It is easy to install and clean. The pump action is nice as well. These were easy to install and seem to function nicely so far. The price is hard to beat for the quality you get! We would order these again if needed. When our soap dispenser broke, I needed to look for a replacement. I searched the site and decided to give this one a try. It was cost effective, and also was quick and easy to install. great affordable product if you don't mind the logo on the front, just make sure you choose your soap to go with the correct dispenser. 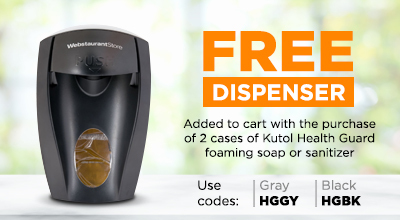 We save an amazing amount of money with the Kutol dispensers. They are high quality at an unbeatable price. The sanitizer lasts so long I feel like I never have to change the pouch. Exactly as it appears in the ad. Several ways to install, all of which appear to be quite easy. I just screwed it to the wall. I tried these dispensers along with the Kutol soap after looking at several brands. These were hands down the best deal and knowing they were backed by the Webstaurant it would be a quality product. We were not disappointed!! Customer satisfaction guaranteed and that's one of the main reasons I order from this website; we try to keep our customers happy, so thanks for your quick process! 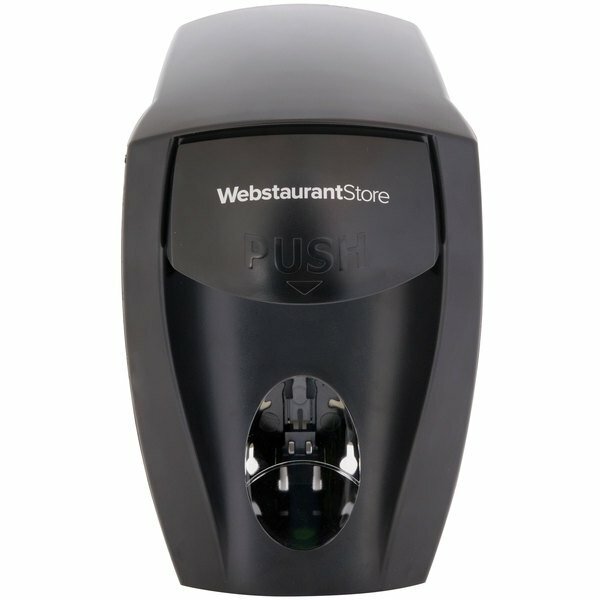 Great dispenser - we use this with the foaming hand soap. Keeps the bathroom tidy and our employees and customers clean! Easy to replace soap and locks for security. This is a great health guard dispenser! It is super easy to install! Buy two and you can offer both hand soap and hand sanitizer!! !